For more on Fancy subscription boxes and a coupon code, jump down below, but let’s get to the review of my October Jennifer Love Hewitt Fancy Box. 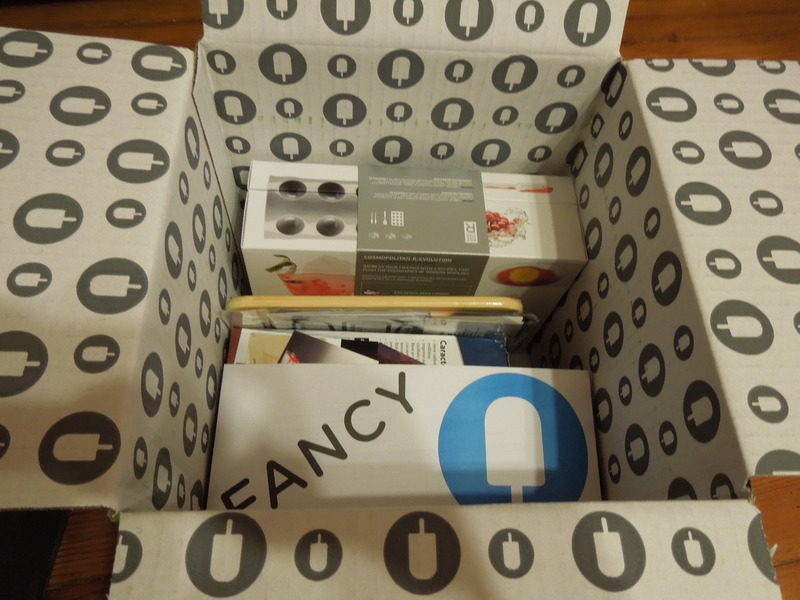 This is one of the five celebrity curated boxes that Fancy offers. Somehow Jennifer Love Hewitt must have known that October is my birthday month because she sent me a party in a box. 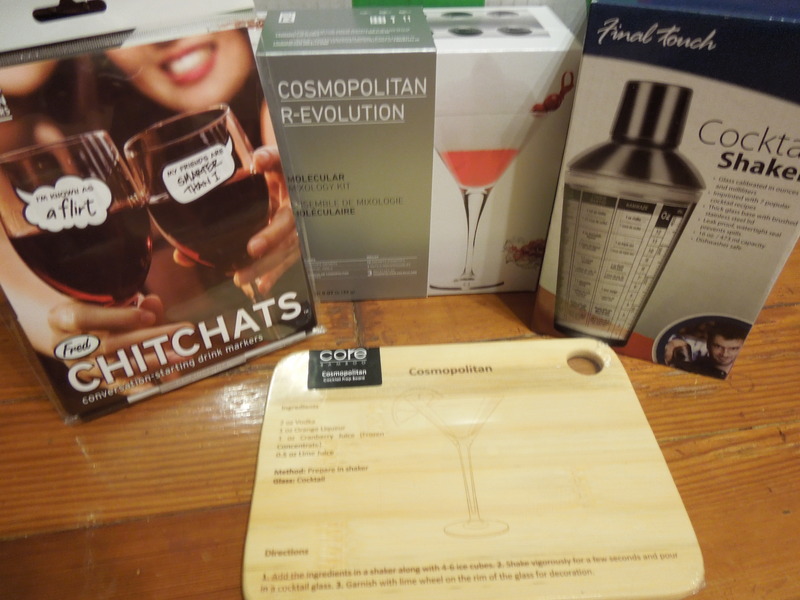 I was a bit disappointed with her last month, but she’s more than made up for it with a booze themed box centering around her favorite drink, the Cosmopolitan. 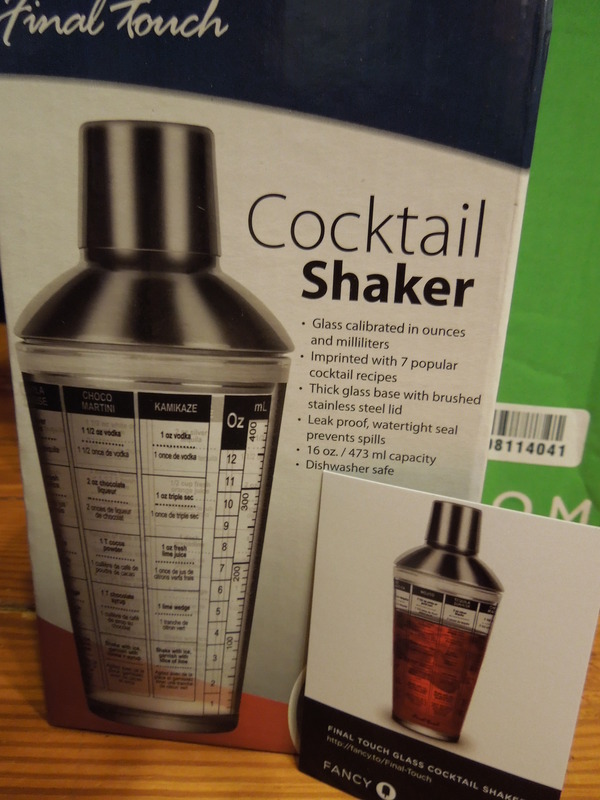 This is a really sturdy and practical cocktail shaker. 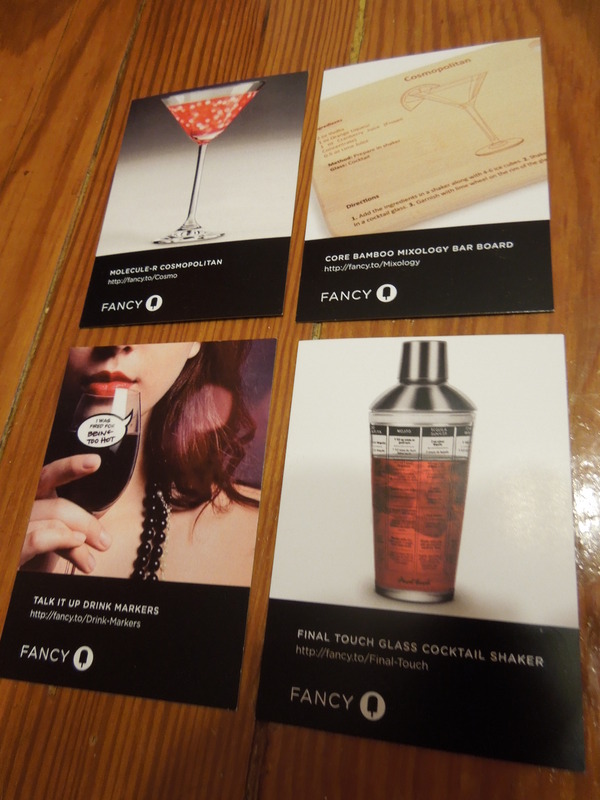 It’s got seven different drink recipes written on the glass along with measurements in both ounce and milliliter. I have a metal cocktail shaker, but I’ve been wanting an additional glass one so we can make more than one cocktail at a time. 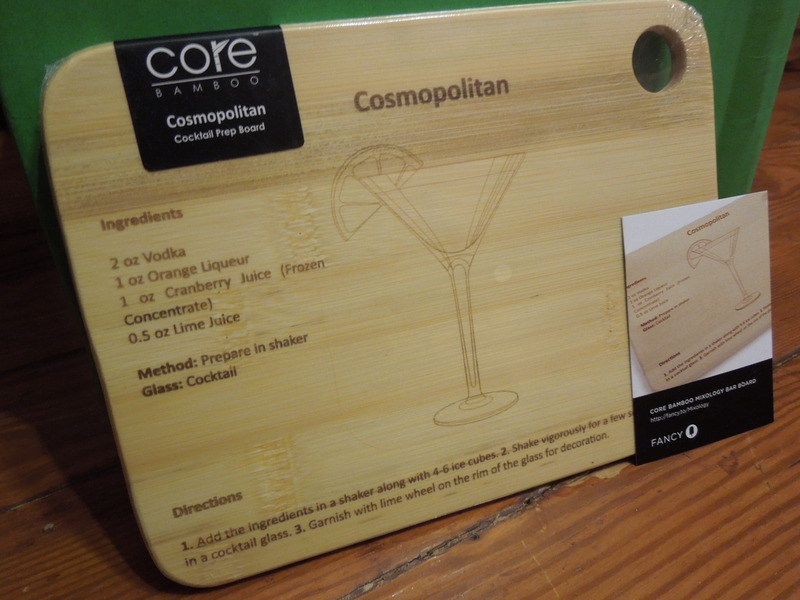 This little bar board has a recipe for a cosmopolitan cut right in. It’s a great size and it has a hole cut in the corner so you can hang it up. I actually don’t own a cutting board in this size nor do I have one just for my bar. This is a welcome addition. 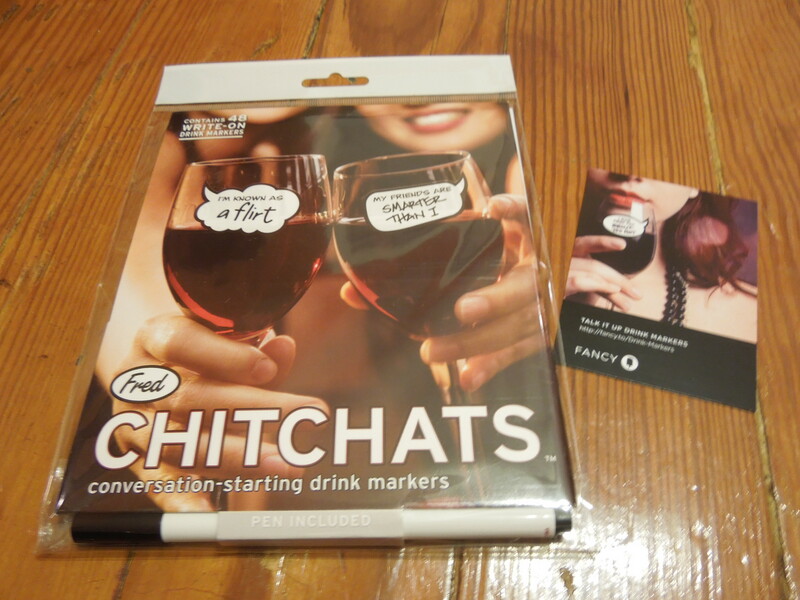 These are reusable drink markers that let you write fun messages. While I’d probably never pick these up on my own because I don’t tend to have large parties, they’re fun and I’m sure I’ll pull a few out for my birthday. This kit includes 3 recipes for molecular mixology at home. 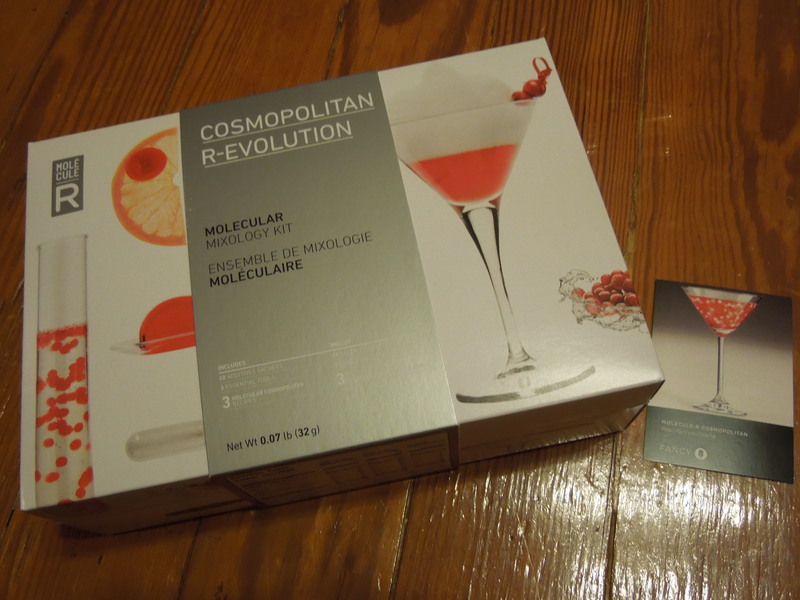 You get encapsulated cosmopolitan, cranberry foam and citrus caviar. I have been dying to try one of these kits, but they were always way more than I wanted to spend. I was so excited to see this and I can’t wait to try it out with some friends. So overall, I was thrilled with this box. I will use every single item. This is my first Fancy box that really had a solid theme and I hope they do this more in the future. I also liked that it had a real connection to Jennifer Love Hewitt by featuring her favorite drink. Now if you’re not a drinker, you could be disappointed by this box. However, each of these items can be coupled with a corresponding bottle of booze to make a great gift. It’s particularly suited for hostess gifts. As long as you know some people who like to booze it up from time to time, you can still get a lot of use out of this box. What did you guys think? Would you have loved the booze filled box or been bored with the theme?